Wow, what an explosive ending! I started Ruin and Rising not remember anything that happened in the series- it has been a long time since I've read Siege and Storm. I actually went back and read the second book again before continuing on past the first chapter of R&R. I am so glad I did- there was a ton in the second book I forgot about. In Ruin and Rising, we pick up with Alina literally a month or two after the end of Siege and Storm. We aren't sure if the Darkling is dead or alive and Alina is left powerless and is living underground. I love Alina's character. I love how strong she is and how she is able to discern the people around her. She knows who she can trust and who she can't. 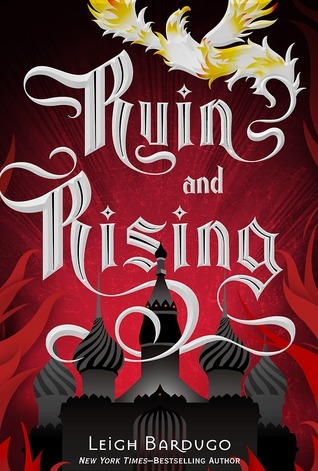 There was not a ton of romance in Ruin and Rising- just a lot of longing looks and emotions. I have to say, though, it was a very emotional book and I didn't really miss the romance. This book totally pulled a Harry Potter on me. I won't reveal why that is- but there is such a HUGE twist in the story. It caught me absolutely off guard. I really felt like the author went for it. She didn't hold anything back for her characters (and was a bit ruthless towards them). There are many shocking and gasping points in this book and you will absolutely find yourself completely immersed in Ravka and under its spell. If you for some reason haven't started this series- now is the time. The series is complete and it is magnificent. Go. Read it. You won't be sorry. So, the publisher didn't send out ARCs for this one, and, honestly, I'm glad they didn't, because then I would have spent forever with only other bloggers to squee to about this book. Instead, we got to read it with everyone else, and share our joy with all readers, so that's pretty cool. I'd recommend at least skimming a review or summary of Siege and Storm before starting this one, since like Coranne said, this picks up in the timeline fairly shortly thereafter. There are enough reminders in the text of what happened, if you don't, but it could help. Bardugo does a great job of slipping in facts you need to know without it being heavy-handed or word-vomit-y, so it never feels like you're rehashing the old story just to get to the new one. This book was just a fantastic way to end the trilogy. I never found it boring, and we got closer to all of the characters throughout. I was never able to guess where it was going to go -- I had suspicions, but Bardugo is so excellent at doing the unexpected that I wasn't ever really sure, which was great. A lot of the problems I had with Mal in the second book were fixed in this one -- whether he grew as a character or we just backed off from his moping, I don't know, but I was much less eye-roll-y over it all in this one. I am so glad that I let Coranne bully me into reading this series, because it is definitely one of my all-time favorites. Now that the whole series is finished, I'm looking forward to reading it all over again. You should definitely give it a chance, if you've never picked these books up before. I really doubt that you'll regret it.